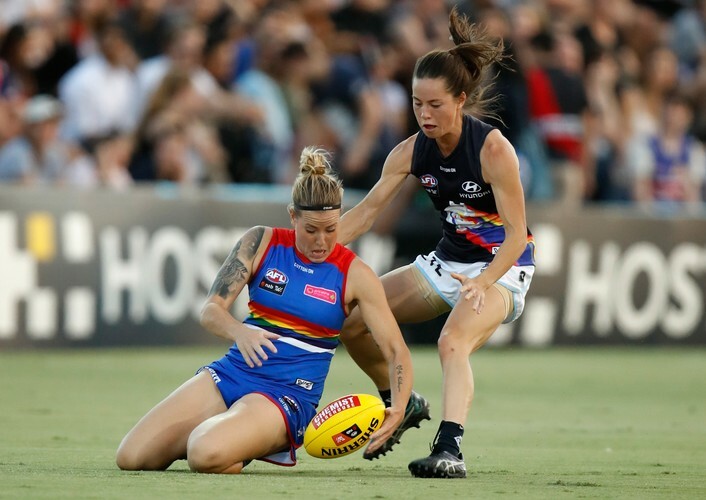 This is the very special, annual AFLW Pride Game. Don’t miss the second last game of the 2019 season when the Western Bulldogs take on Carlton at VU Whitten Oval. It’s going to be one of the best Sunday afternoons of footy, ever—two iconic Melbourne teams, and their supporters, standing up for inclusion, change and recognition for the LGBTI community. It’s another way that the AFLW and their GenW campaign is working to empower girls and women from all backgrounds. And, it’s a cause and a game worth getting behind. Both teams will wear specially designed pride guernseys, which will also be on sale in the Fan Zone and Bulldogs Shop. The Pancake Parlour will be running activities, including a giant ball pit where you can win Pancake Parlour vouchers; and a pop-up bar called ‘The Parlour’. There’ll also be food trucks, a Cape Grim BBQ, and the Two Birds Brewery Bar. And, if that’s not enough, a photo booth, a chill-out zone, temporary tattoos, inflatable fun, and a DJ to keep the party going. Pack mascots will be in attendance, plus plenty of giveaways including free ice-cream. After getting inspired by the match, head onto the field like your AFLW heroes for McDonald's kick to kick.